In some areas of New Mexico, the anxious sound of a dog might just be … a frog. The two share a common trait: They both bark. The word is even in its common name, the eastern barking frog. Found in the Chihuahuan desert in southern New Mexico, the barking frog lives in arid conditions and has a limited range in the state. Above: Aptly named, the eastern barking frog sounds like a domestic dog when bellowing for a mate. 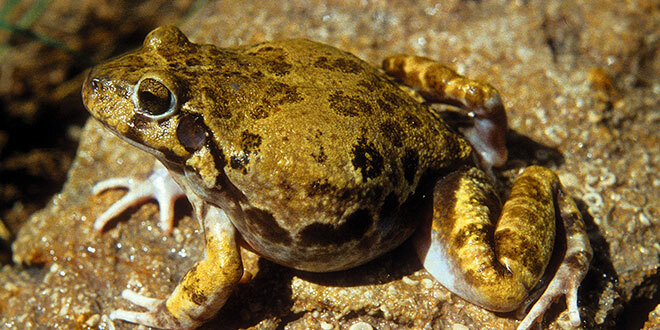 Unlike any other amphibian in New Mexico, eastern barking frogs do not have a tadpole stage. Instead, they metamorphose within the egg, so there is no aquatic stage in the life cycle. Photo by James Stewart. The New Mexico Department of Game and Fish has a history of monitoring the status of the eastern barking frog, Craugastor augusti, which can be found in Chaves, Dona Ana, Eddy, and Otero counties. The appearance of the frog is distinctive, with a broad head and chunky body, but small limbs and enlarged toes believed to aid in climbing. The adult barking frog is greenish or brown and has dark blotches, whereas juveniles are dark with a light cream band crosswise over the back. The species is much different from most other amphibians in the state, surviving in arid conditions, generally in creosote flats with soils amenable for burrowing to provide shelter from the sun and predators. The barking frog also differs in how it reproduces. All other amphibians in New Mexico lay eggs that hatch into a tadpole and the tadpole then changes into a small version of an adult. The barking frog, however, lays eggs that hatch straight into juvenile form, skipping the tadpole stage. Perhaps most unusual of all is its call. Because its habitat is dry and it has limited range within the state, the species was deemed a “Species of Greatest Conservation Need” under the 2006 Comprehensive Wildlife Conservation Strategy. In 2015, researchers from the University of New Mexico, with a grant from the department’s Share with Wildlife program, assessed the status of the species in the state. These people, trained in the call of the barking frog and where to find it, went out to historic sites to determine if the frog was still breeding in particular locations. The researchers found several important populations in the regions of Roswell and Carlsbad, near the Organ Mountains close to Las Cruces and north of Dell City, Texas, on the southeastern New Mexico border. Bitter Lakes National Wildlife Refuge near Roswell continues to have a healthy population, but researchers found the project to be challenging because of the nature of the barking frog. The species is secretive and is only detectible when it is calling to find a mate. That only happens when the right rainfall conditions occur, often just for a few days. The eastern barking frog occurs in the southeastern portion of New Mexico. 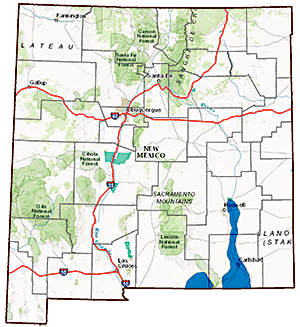 A study conducted by UNM researchers surveyed several important populations, including the Bitter Lakes National Wildlife Refuge near Roswell, as well as one not on this map in the mountains near Las Cruces. The timing of the barking frog’s activity has Game and Fish looking for public assistance. Within their findings, the researchers recommended using local citizen science volunteers to monitor important areas for the barking frog. Given the tight window of opportunity each year, local volunteers would have the best chance to hear the call of the frogs at the most opportune times. Department personnel are working with the researchers to set up forms and maps to be given to interested volunteers, along with instructions on how to properly monitor for the barking frog, including identification of the call, and how to submit their data. The plan is to have everything in place by May, when breeding might begin, depending on rainfall. The objective is to build upon the work already done by way of citizen science, providing New Mexicans with an opportunity to help the department meet its goal of conserving wildlife for future generations. Those interested in participating should contact Leland Pierce at (505) 476-8094 or email leland.pierce@state.nm.us. Leland Pierce is the herpetologist for the New Mexico Department of Game and Fish. He is entering his 14th year with the department, first as the GIS coordinator and then as a recovery coordinator before taking his current position. Pierce has been involved in the conservation of amphibians and reptiles, particularly in New Mexico, for nearly 30 years. Contact: (505) 476-8094 or email leland. pierce@state.nm.us.